Do your kids love drums? 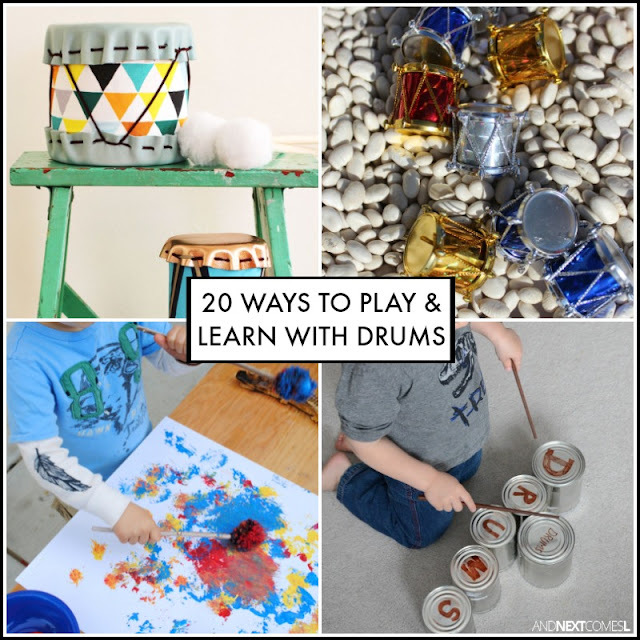 Then they're going to love these drum themed musical activities for kids! A couple of years ago I intended to do an ABCs of Music for kids series, but quickly fell behind because it was hard to find good music activities for kids to fit a lot of the themes that I wanted to cover. However, I am determined to get the rest of the letters finished off at some point. Even if it's sporadic and a slow process. 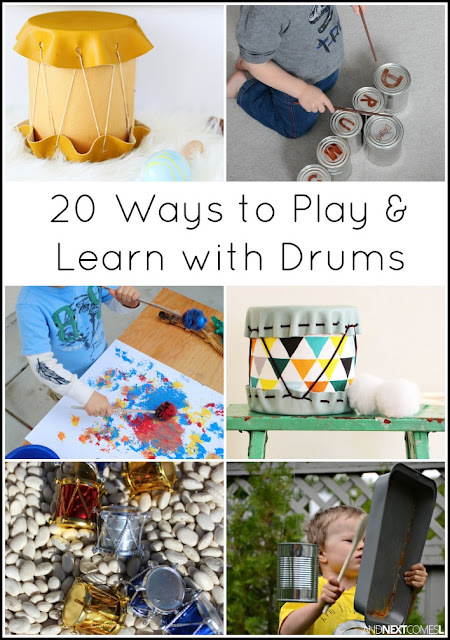 So today I'm sharing 20 ways to play and learn with drums as a way to finish off letter D in the series. From crafts to homemade drums to a drum sensory bin, these fun music activities are great for kids of all ages. 1. Spelling with Tin Can Drums - Practice spelling words using drums. Yes, really! 2. Drums in the Musical Science Pool - A great way to explore science (and keep the kids cool!) is with this musical science pool. As an alternative, try it in the bathtub! 3. DIY Drums from A Beautiful Mess - Make a set of these gorgeous DIY drums for your kids. 4. Drumstick Painting from Crayon Box Chronicles - Here's a fun way to paint using DIY pom pom drumsticks. 5. Exploring Tempo in Music with 2 Simple Drum Games - This activity is quite calming for kids when you beat the drum at a slow, even tempo, but going fast encourages the kids to get moving! 6. Little Drummer Boy Sensory Bin from Frogs & Snails & Puppy Dog Tail - Sure it's based off of a Christmas song, but this sensory bin is a fun way to play with drums. 7. Duct Tape Practice Drum from Frugal Fun for Boys - An awesome drum craft for kids. 8. Rattle Drum Craft from Pink Stripey Socks - Another cute drum craft for kids. 9. Bucket Drumming & Stomping - For some gross motor music play, try bucket drumming and stomping. 10. Teaching Kids How Sound is Made from Kids Activities Blog - Explore the science of sound with this great drumming activity. 11. Books About Drums from Growing Book by Book - Try reading books about drums with this great list of children's books. 12. Homemade Rhythm Set from Inner Child Fun - Use objects from around the house to set up this quick and easy drumming station. 13. DIY Recycled Outdoor Drumming Station - Grab some recyclables and upcycle them into this fabulous temporary outdoor drumming station. 14. DIY Toy Leather Drum from Say Yes - Another gorgeous homemade drum for kids. 15. Rainbow Drums on the Light Table - Playing drums on the light table is a great sensory experience for kids. 16. Homemade Duct Tape Drum from Minne Mama- A colorful drum craft for kids. 17. Grow Stick Drumming - Turn out the lights and grab some glow sticks for this simple drum activity. 18. Play Drums on your iPad from iGameMom - Explore different drum set sounds right on your iPad with this app suggestion. 19. Tin Can Drum - For a quick craft, let the kids design their own tin can drums to play with. 20. Glow in the Dark Drum from Happily Ever Mom - Transform a drum into a glow in the dark drum with this simple idea.